I hope you get some relief soon. Keep writing. Sending best wishes to you. It was for possible medicare. Yes, it was hard – surprisingly. Having another confirmation of BPD … I want to be done with this, yet it appears it may never happen. I guess it’s more what those around me continue to face … me. does that seem like a helpful thing….to maybe be eligible for medicare? Would that help you get counseling? I know that the BPD diagnosis is a really awfully bitter pill to swallow. Having the same diagnosis as you, the stigma is terrible and the hopelessness and frustration involved is real bad. It’s tough for me to be able to offer any advice right now but in saying that, I really do hope that we can all really fight this, inform ourselves as much as possible and live the best lives that we can even though it can be very debilitating. Hopefully our efforts will pay off by dedicating ourselves to therapy and stuff. Thanks. There are no real answers. Knowing we are not alone helps. 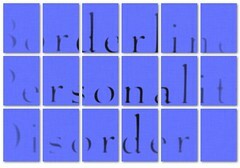 I for one dislike the term ‘borderline personality disorder’. I mean come on medical profession, who are you to say if someone’s personality is borderline. Everyone has a personality, therefore nobody’s personality is borderline. Sorry you found the confirmed diagnosis hard to take. I was under the impression that if you have bpd, it is a lifelong condition? I have bipolar & I’ve come to accept it as something I’ll always have. Hope you start to feel better soon! It is a lifelong condition … but something inside of me continued to hope it would pass. This is the problem I have with diagnoses: You’re tacked a label on and then are left alone with it. 😦 I’m also not convinced of the validity of diagnostic manuals as they simply provide lists of symptoms and you get the diagnosis when you have a sufficient number of symptoms. My husband and I are both psychologists and my husband is currently undergoing education to become a therapist and works with BPD patients quite a lot. He told me that although I’m usually not emotionally unstable in the BPD sense, I’d easily get the diagnosis because I have sufficient other symptoms (such as dissociative states, low self-esteem, impulsive behaviors, etc). So basically diagnoses just group symptoms together in a label, and then you suddenly have a social category for those with a certain diagnosis that opens up the doors for stigmatization. I believe it would be more helpful to work with people on the basis of non-stigmatizing, nonjudgmental, descriptive evaluations of patterns of thinking, feeling, and behavior. I very much hope the diagnosis doesn’t put you down too much – it doesn’t condemn you to stay this way for the rest of your life because things are always in flow! I would like a remission from symptoms that lasted the rest of my life though. I’m almost 51 and am just SO tired of the instability that this has made of my life and how difficult it is for me, not to mention my husband and son! Label or not, I still need help.